Kelly Irving uncovers mystery and history on a luxurious island in northern Queensland. The helicopter skims across the bright waters of the Coral Sea, revealing a chain of emerald islands at my feet. Untrammeled nature lies in every direction, from golden sands to coconut palms and coral reefs – the embodiment of tropical north Queensland. Shadows of a couple of large late-afternoon clouds pour over the ranges like spilt paint, as an island of considerable size (the second-largest in the Palm Island group) comes into view. Orpheus Island, where I’m about to land, is located in a region of Australia shrouded in as much mystery as there is history. It’s 80 kilometres north-west of Townsville and a 10-minute chopper ride (or 20-minute boat trip) from Palm Island, which was described as an ‘open-air jail’ for Indigenous Australians during much of the twentieth century. Between both islands lies Fantome Island – a secret leper colony right up until the end of the 1970s. As I step out of the chopper, I’m thankful that tourism has never really taken off in these parts. A national park and a Great Barrier Reef sanctuary, Orpheus has just one boutique resort, catering for up to 34 guests on the whole 1300-hectare island. Walking across its pretty, manicured lawn, the wind sings a light melody and there’s not a souvenir seller or cork hat in sight. 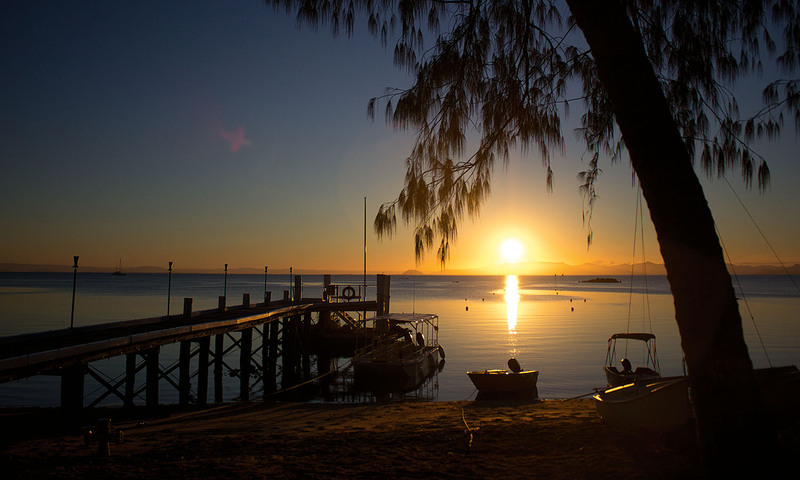 Whereas XXXX Gold-guzzling Aussies flock to Magnetic Island, or ‘Maggie’, the seclusion of Orpheus has attracted the likes of Elton John, Vivien Leigh and Mickey Rooney. But don’t let that fool you into thinking this place is only for the exceedingly well heeled. Food is delivered here once a week by barge, so at other times you’re expected to get down and dirty with the cooks and catch it. “Take a look at this!” yells Arie, a fine-dining chef from Melbourne who’s only been on the island for three weeks, yet hops around the rocks, spear in hand, like a pro. It’s been a couple of hours since my arrival and the tide is low. All the dinghies that were earlier bobbing happily in the water now look like they’ve been washed up onto the moon. I pad after him along the shore, struggling to carry a bucket of the biggest oysters I have ever seen. “Stingray for dinner,” he says, smiling at his prize as he holds it high in the air with one hand, the bloody spear in the other. Later that night, at a candlelit table on the deck of the outdoor restaurant, I’m thankful the Queensland heat permits me to wear a loose dress. The feast that’s laid out before me – oysters baked in sesame crust, seared Harvey Bay scallops, Burgundy-style crayfish, snapper ravioli, kangaroo fillet with smoked potato puree, and banana curry – would surely break top, middle and bottom buttons. I pull up a log on the beach next to the campfire and take some time out to digest with the handful of other guests. We chat, laugh, drink far too many lychee martinis and watch as the sky turns a kaleidoscope of red, pink, mandarin and golden yellow. I feel a galaxy away from city life. I wake early to the trill of little birds and rainbow lorikeets dancing in the trees. Eager to learn more about the origins of the area, I join another guest and take a 10-minute boat trip over to Fantome Island for a walk with Tom, a local guide from Palm Island. Fantome is a startling mix of tropical paradise and prison. A leprosarium for Indigenous Australians, it was run by nuns from 1939 to 1973 and kept secret by the state government. Queensland’s answer to stopping the disease was to take Indigenous Australians from their families and confine them to this lonely outpost. When it was closed, it was purged by fire. Later it became the site of more than 200 graves. Sunset on an oceanic horizan. We walk through the waist-high grass, down the ‘High St’, past an abandoned tin shed and bits of corrugated iron – remnants from Cyclone Yasi last year. We follow the bleating of goats and their little tracks in the sand. We stop every couple of strides as Tom points out a plant, tree or flower that has some important purpose, like Chinese apple trees (a sign of early Chinese settlers in the 1900s) and wild lemons. “Good for cooking – and hangovers,” says Tom, as he collects some for Arie and I pocket some for later. Back on the boat, as we begin to head out to sea, a group of turtles joins us in the spray. A slight taint of turquoise indicates shallow water where, to our delight, they perform a ballet, while white eagles circle overhead. We approach ‘the green zone’, a protected part of the Great Barrier Reef, pull on our masks and fins and slip off the edge into the 28-degree water. I take a breath and then swim down, kicking to the bottom and gliding over the coral-strewn seabed, as tiny, multi-coloured fish dart out of my way. The next couple of hours somehow meld into the next couple of days. I snorkel an area inhabited by hundreds of giant clams, take a sunset cruise and watch for manta rays and humpback whales. I explore Yanks Jetty and pretty pockets of secluded beach, where guests picnic and goannas are said to stroll. Then finally, I swap flippers for flopping and perfect the art of dozing in a hammock, fruity cocktail in hand. I’ve spent a lot of time travelling and trying to avoid the tourist traps and crowds. And in the space of just a few days I’ve discovered that the best spots are often hidden in the most unlikely spots – not too far from home. Qantas flies to Townsville from most Australian capital cities from AU$120. Transport to Orpheus Island is arranged by the resort; this may be helicopter, seaplane or boat.